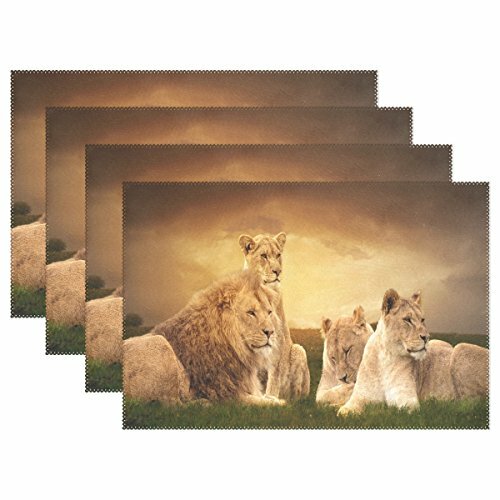 WOZO Fashion Placemats Set of 6, 12" x 18"
Notes:Please kindly know that the bag might appear slightly different because of different screen display settings. Sizes: 12 x 18 inch, including set of 6 placemats. Usage: Perfect for dining room,kitchen,indoor,outdoor for every used. Design: Unique design will show your personal taste and decorate your home. If you have any questions about this product by WOZO, contact us by completing and submitting the form below. If you are looking for a specif part number, please include it with your message. InterestPrint Funny Guinea Pig with Glasses Reading Book Kitchen Table Mats Placemats Set of 4, Cute Animal Place Mat for Dining Table Restaurant Home Decor 12"x18"
InterestPrint Merry Christmas Winter Forest with Baby Sloth Red Ball Placemat Place Mat Set of 6, Cartoon Animal Santa Hat Table Place Mats for Kitchen Dining Table Restaurant Home Decor 12"x18"